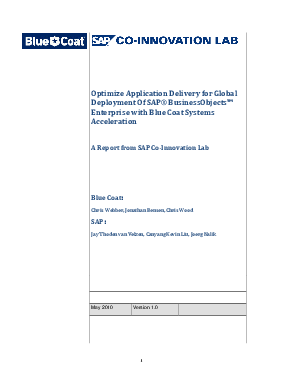 SAP and Blue Coat worked closely in SAP Co-Innovation Lab to develop a joint solution to mitigate wide area network impact on global deployment of SAP BusinessObjects Enterprise. Our testing shows that the joint solution provides a tremendous improvement in the user experiences of SAP BusinessObjects Enterprise for all WAN conditions tested. In these tests, Blue Coat demonstrated bandwidth reduction of up to 95%, and up to 40 times faster response time across all the WAN conditions.